For the fifth consecutive year, Crowley Maritime Corp. has been honored in 2017 as one of the Healthiest Companies in America by Interactive Health, a national leader for personalized wellness solutions. Crowley is among 184 companies nationally being recognized for helping employees improve their health, sometimes with life-saving changes. As Crowley has emphasized wellness programs, employee health improvements have surpassed baseline trends among companies participating with Interactive Health. Crowley has been honored as a National Best and Brightest in Wellness winner by the National Association for Business Resources (NABR), which evaluates and assesses the quality and excellence of workplace health awareness and programs. Crowley’s “Live Well” wellness program promotes the health and wellness of employees by creating a work environment that nurtures all dimensions of wellness while heightening engagement, reinforcing healthy behaviors, increasing performance and controlling health care expenditures. Crowley was honored once again as one of the healthiest companies in the region by the First Coast Worksite Wellness Council (FCWWC). The company was selected for the 2015 Healthiest Companies Award in the platinum category for its demonstrated commitment to employee health and well-being through the implementation of comprehensive worksite health-promotion strategies. The FCWWC is an organization that has a mission of improving the health of the First Coast community by sharing resources and providing guidance to its member companies. Crowley Fuels has been honored with the ConocoPhillips/Alaska Trucking Association (ATA) “Alaska Safe Truck Fleet of the Year” award in the Line Haul Division (fleet size under 50 units) for continuing to perform at an elite level of safety. To be considered for the “Alaska Safe Truck Fleet of the Year” award, the Crowley team was evaluated and ranked on several 2016 statistics, including the total number of miles driven, the company’s Federal Motor Carrier Safety Administration CSA fleet scores, accident frequency and overall Occupational Safety and Health Administration (OSHA) rate. 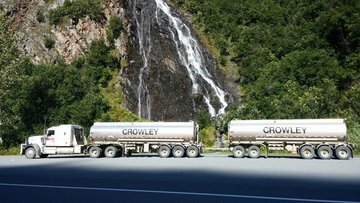 Last year, drivers of the Crowley fleet of more than 100 vehicles, which includes 27 line haul trucks, drove almost 3 million miles while delivering more than 150 million gallons of petroleum products to communities across Alaska. 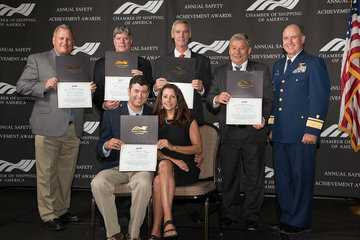 Ninety-three Crowley owned or managed vessels recently received the Chamber of Shipping of America (CSA)’s annual Jones F. Devlin Awards in recognition of their outstanding safety records in 2016. Each year, the CSA grants Devlin Award certificates to manned merchant vessels that have operated for two or more years without incurring a Lost Time Injury (LTI), specifically highlighting the skills and dedication of the crewmembers responsible for safe vessel operations. Crowley’s 2016 Devlin Award-worthy vessels together have achieved an impressive 691 years of service without an LTI. Crowley Maritime Corp.’s liner and logistics group in Central America received the National Road Safety Recognition for 2015 from the Costa Rica Ministry of Public Works for their focus on regional, national and local road safety. Crowley was recognized for their strategies to reduce accidents and fatalities while transporting cargo. The National Road Safety Recognitions are presented to companies who take a leadership position by formulating and implementing high-level road safety initiatives. 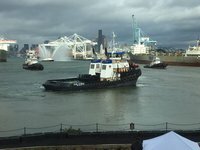 Jensen Maritime Consultants , the Seattle-based naval architecture and marine engineering subsidiary of Crowley, was honored by having two of its tugboat designs be selected among WorkBoat’s 10 Significant Boats of 2017. Jensen’s design work yielded four constructed vessels – Earl W. Redd, Arkansas, Mardi Gras and South Carolina. For the eighth consecutive year, Crowley Logistics Inc. has been selected as an Inbound Logistics Top 100 Third-party Logistics (3PL) provider. Each year, Inbound Logistics’ editorial team has selected Crowley based on its ability to offer diverse operational capabilities, scalability and experiences to meet customers’ supply chain and logistics needs. Crowley’s liner services group has been honored with its 15th Quest for Quality Award by Logistics Management Magazine (LM), this year in the Ocean Carrier category. In bestowing the award, readers recognized Crowley as a 2017 “Best of the Best” ocean carrier for its high scores across LM’s critical service criteria, which includes on-time performance, value, information technology, customer service, and equipment and operations in the transportation and logistics industry. Crowley collects personal information you choose to provide through our recruiting portals. Crowley will not contact you to provide personal information during the recruiting process or when an offer is presented. If you have any questions about a communication you received from us, please contact us at 1-800-CROWLEY or send an e-mail to careers@crowley.com .